Dyer’s chamomile. 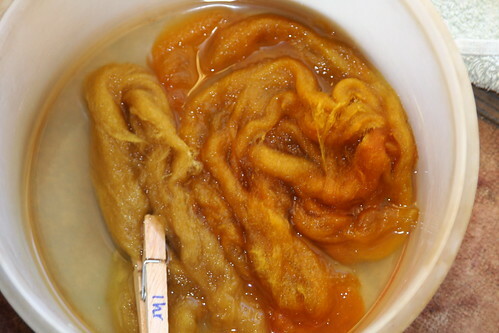 On the left is the second dye bath – prepared not from the exhaust, but resoaking the flower heads, simmering and generally re-doing the dye bath with 50 g of alum mordanted 56s English Wool. 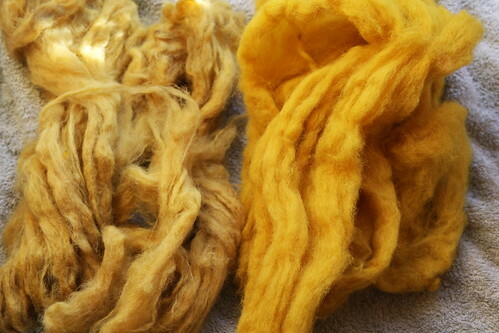 The right is the first dye bath. The photo does not do the colours justice. When I went to iron modify the soaking samples, I discovered that my cleaning of the madder soaking bowl was not has thorough as it might have been. Oohps. But instead of just damp yellow,I now have two very lovely orange-tinged samples. I am going to steam these to make sure the stain is fixed – and then sadden some of it. I am saving the rest for the testing of the Indigo and Weld dye baths which will happen next. Don’t know where to start with this. Ordered the kit from Fiery Felts – beautiful, tactile, comprehensive and fact filled. Ordered the kit from DT crafts – comprehensive and fact-filled, and with all the ingredients, so I don’t have to go out and find a 1.2 litre jam jar (on the case though – found the pickling jar is about the right size) with a little more of a clue as to how to start. Same as before, I am totally in awe and fear of a process I don’t understand. If I don’t know where to start, I tend to make it so overcomplicated I don’t start at all. So I am going to write a list of what I need – seems at the moment I just need some tongs and a drip tray. Have read both booklets from cover to cover – and will commence battle when I have some time next week. I have also ordered some linen samples, and have found some silk, so will test those at the same time. I was asked last time which kit or brand of extracts I preferred. There is no simple answer to this. I found DT’s Hue and Dye, along with Earthues, the simplest for a complete beginner to approach (even though I wasn’t a beginner, it could be classed as dyeing for the petrified), but then found using the tinctoria added more to the pallette, and by the time I got to the actual natural dyes, because I knew more about what I was trying to achieve, I had more confidence in what I was doing and I understood more about the process. In between I had read a few books from cover to cover. Oh and the suppliers held my hand, which helped immensely. Colours from Nature from Jenny Dean and The Complete Guide to Natural Dyeing by Eva Lambert and Tracy Kendall. The information in these, I matched up with articles from the Guild Journal, and some on-line workshops from the Online Guild of the Spinners, Dyers and Weavers, and somehow it all made sense and interconnected. Finger’s crossed the same will happen when I start on the indigo. I am also spinning again for myself. I have so many 20g’s floating around, I haven’t really known what to do about them, and I need to clear up, the mess around me is now becoming overwhelming. So I am now spinning them up in large skeins, so I have some weights and amounts of complimentary colours that I can do something with. I will probably weave them. I am saving all the precious fibre for hand splndling and all the pure wool ones are going in the current project. I am also on mitten one of W’s wristwarmers. He is a very large guy at the Unit, whose mitts shrunk when washed by accident. Catastrophe or what !!!! I had not been able to make up my mind in what form to make the new ones, and with winter coming on, this is now getting a bit urgent. Wool – fire-retardant and enjoyable to knit, but shrinkable. Superwash, not so enjoyable to knit, won’t shrink, but worried about fire hazard (W smokes). Doesn’t take a lot to put my world right !